Each year, around 3,000 California drivers lose their lives in car crashes. There are over 38 million residents in the state; approximately 25 million are licensed drivers. It is estimated that a person will be in a car wreck once every 17 to 18 years of their life. For those who start driving at 16, there’s a good chance this person will be in an average of four car accidents in his or her lifetime! If being in at least one car accident in your lifetime is a guarantee, how can you be assured you’ll survive your wreck? What tips and tools can you use to maximize your safety and assure you spend another night tucked safely into bed? In this blog, we’ll break it down into simple ABC’s. We’ll talk about what to do to avoid a crash, how you can carefully conduct yourself at the scene to save your life, the life of your loved ones and help you to fortify your crash claim or lawsuit. Your first step in car crash safety is to do your best not to have one in the first place. That may seem obvious, but remember that you can only control your actions behind the wheel. You have no control over the carelessness or skill of other drivers. So, the more assertive, aware and skillful a driver you are, the more chance you have of avoiding an accident in general. Read up on these tips to make you a more assertive and aware driver! a car accident checklist with your vehicle registration to eliminate guesswork during these challenging times. Leave the distractions at home. Distracted driving causes a ton of car accidents every year. What does this mean? Don’t take your eyes off the road, your hands off the wheel or your mind off the task of driving. You may be tempted to fidget with the radio, your satellite radio or text behind the wheel. Do everything you can to avoid this. Want to enjoy some tunes? Set up your playlist before leaving the parking lot. Aim only to be behind the wheel when you are calm and of sound mind. Middle road is the safest ground! If you’re driving on a road with more than two lanes, stick to the middle lane. If a fast maneuver is needed to keep you safe, you can veer off to the left or right; more options mean more safety for you. The left lane, known as the “fast lane,” is harder to escape if needed, as it usually bumps up to a concrete barrier without any shoulder. Focus on the road ahead and your blind spots; those are two of the places most likely to get you in trouble! Looking several cars ahead assures you can see any trouble before it becomes an issue. For example, it will help you avoid fallen debris or a pileup. Also, you will want to pay extra attention to your blind spots. All vehicles have them, but how prominent they are depends on the shape and size of your vehicle. Maintain control of your steering wheel at all times. Have you ever really thought about how you hold onto your steering wheel? We’re betting you haven’t. Besides that one time in drivers education when they obsessively made you hold your wheel textbook-style, there’s a good chance you drive in a variety of interesting positions. (We’re looking at you, knee-controlling-steering-wheel-driver!) To avoid an accident, you want to be assertive and secure in how you hold onto the wheel. Keep your hands at the nine and three o’clock positions at all times. You can also take a cue from Dale Earnhardt Jr., and make sure you are seated close enough to the wheel like racecar drivers sit, so your wrist rests on top of it and your back is straight against the seat. Get up close and personal with your car. Some people drive family-friendly sedans; others drive sportscars. Both are great choices. However, there is a distinct difference between what each of these cars is capable of doing. Would you run an unsteady pony in the Kentucky Derby? To be blunt, you need to know the limits of your specific vehicle. How long does it take for your vehicle to come to a complete stop? How worn are the treads on your tires? How sharp a turn can you take without it tipping over? 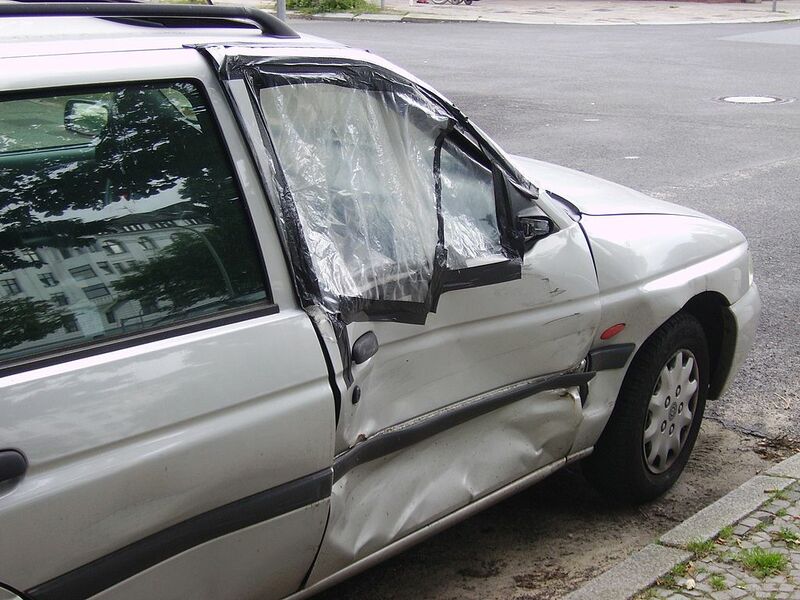 The better you know your car, the more assertive you can be when avoiding an accident! Also, remember to keep your car in top maintenance form. Perform regular oil checks, make sure tire pressure is sound and your brakes are functioning to capacity. You’re in the car, and it’s a given you’re going to have an accident. What to do now? You have seconds to make snap decisions that can make the difference between life and death. Our advice? Be smart! Use these common-sense tactics to give yourself the best chances of survival possible. Keep as calm as possible. Slow down if you can! The faster you are going, the greater the force of your impact. If you have the ability to slow down, do it. Speed is one of the most dangerous factors in a car accident! Steer the car towards something soft. In the few seconds you have, scan the area, and see what is the softest surface around for you to make an impact with. Making impact with a bush, shrubs or a low wooden fence will do a lot less damage to you and your car than, for example, a concrete barrier or another car. Roll into a ditch, skid into a field if you must; do your best to avoid crashing into dense and heavy objects! Maintain control of your vehicle the best you can. This boils down to a few things. First, if you find yourself skidding then go with the skid, not against it. Wait till your wheels have traction before braking or accelerating. Also, handle your breaks accordingly based on whether or not you have antilock brakes. If you have them, let the antilock brakes do their job, and don’t slam the brakes! If you don’t have them, then rhythmically pump your breaks. Slamming down on your breaks will make them lock, and remove any ability you have to control your vehicle! As a final note, try to stay in your seat in proper driving position! Air bags and emergency safety devices will perform to their optimal ability if you stay seated in place as oppose to dodging, ducking or moving inside the vehicle. Step C: Careful conduct at a crash site makes all the difference! Once an accident has occurred, more than likely you will be disoriented and in shock, in the middle of the road or pulled over to the curb. Here are the careful details to keep in mind that will help keep you safe. Call 911 for immediate help. This is a no-brainer. If the accident damage is anything more than a small scratch, especially if you are not at fault, it is best to call emergency services. Stay… until it’s time to go! Are you safe staying exactly where you are? Did your accident occur in the middle of a busy freeway,or are you safely on the side of a neighborhood street? Before you get out of the car, do a quick check of your surroundings to see where you will be the safest. Car crashes are already dangerous situations. Add a gas-fueled fire on top of that, and you have a recipe for major trouble! Turn off the engine in your car, and avoid smoking a cigarette at the scene. Stay at the scene of your accident until law enforcement authorities clear you to go. Leaving before can constitute a hit-and-run for you! The only exception to this rule is if you are taken away by an ambulance for immediate and life-saving medical attention. Photos of the accident site, the vehicles involved and any surrounding details that can support your case. Remember, it is not your job to talk and give information to the other participants at the scene of an accident! Be polite but do not talk about details of the accident or who is at fault. Any of these words can be used against you later, so it is best to say as little as possible. If the accident you have been in is substantial, you’ll want to call an attorney from the scene of the crash. The bigger your accident is, the more potential for big insurance companies to be involved, and the more risk there is for you! This is even more important if your crash involved a commercial vehicle or truck! Contact the Law Offices of David Azizi anytime 24/7 at 800-991-5292 for help! While your first concern at an accident site should be to secure immediate medical attention, if needed, the next most important thing is to start your case right on the spot. How you act, what you say and what you do can all make or break the outcome of your case! An experienced car crash attorney like David Azizi understands what is needed to protect your rights, make a strong case and get you the compensation that you deserve! Our primary concern is doing what’s best for you and getting your life back to normal as quickly as possible! Contact us today for a 100-percent risk-free case review!